Strategic plan lacks clear mission, so board agrees to champion ‘100 percent graduation,’ but how? 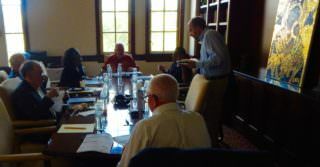 School board members and facilitator Jeff Nelsen (far right) at USC’s Caruso Catholic Center for a special committee meeting. LA Unified’s three-year strategic plan lacks a clear mission statement. That was the consensus of an all-day school board session Tuesday. So the seven board members decided to fix it, landing on the goal of a 100 percent graduation rate. Yet the draft of the strategic plan remains light on exactly how to accomplish it. Because even with every teacher and principal knowing that 100 percent graduation will be the ultimate goal for the district, the three-year plan presented by Superintendent Michelle King offers targets that expect only 81 percent graduation by 2018-2019, and only 52 percent of students getting a C or better in the A-G classes required for graduation. Board members agreed that while a 10-point increase in the graduation rate to 75 percent from the 2010-2011 school year was significant, it wasn’t enough. Draft of strategic plan targets. The strategic plan does not directly address what King has previously acknowledged as two of the most pressing issues facing the district: the decrease in enrollment and a serious financial deficit, which she addressed last spring when she held a series of meetings before the budget was approved to discuss major challenges. In a brainstorming session Tuesday that was described in the agenda as discussing “vision elements and core values” rather than specifics of the strategic plan, the school board was led by Jeff Nelsen of Targeted Leadership Consulting who has coached more than 2,000 principals and school leaders over the past decade. Zimmer’s preferred goals are to eradicate the school readiness gap and have every graduate be bilingual and bi-literate. “We can lead the state and the nation with this,” he said. School board members with Superintendent Michelle King and facilitator Jeff Nelsen. And the strategic plan does not include the 100 graduation rate in its seven targeted accomplishments with benchmarks to be hit in the next three years. The seven goals included a 24 percent increase in school pathways such as magnets, dual-language immersion and Linked Learning programs; a 30 percent decrease in chronic absenteeism; and 100 percent access to quality art instruction, a parent computer program and restorative justice practices. Two other goals — of high school students concurrently enrolling in community college and an increase in bilingual, bi-literate graduates — did not have numerical targets yet. “We can have all the mission statements in the world, but if it doesn’t translate to action, it doesn’t matter,” board member Monica Ratliff said. Ratliff said that once every teacher is on board with a unified mission, then everything they do, from preschool to third grade to fifth grade, to children with trauma and more, should all lead to a child graduating from high school. “That provides us with a very clear mission that everything feeds into,” she said. King said some pilot schools in the district have reached 100 percent graduation and they are looking at how to replicate those programs. But she also pointed out that the one-size-fits-all approach that the district used in the past doesn’t work for every district school. King acknowledged, “If there is a common vision and direction that is set forth and folks know where you want to go, it’s better than having competing multiple agendas.” She said, “You can’t go anywhere by spinning around about this one and that one, all that energy dissipates.” She said she plans to outline clear messages that don’t contradict each other and then plans to get the word out to kids, parents, educators and all school stakeholders. 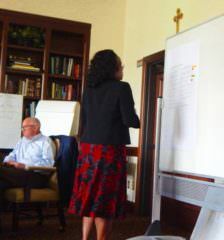 Michelle King at the white board with Jeff Nelsen, facilitator. Board members Ref Rodriguez and Zimmer both pointed out that statistics prove that early education helps achieve college-ready graduates. Board member Monica Garcia said she champions the 100 percent graduation goal and they all need to work out what can be done most immediately. King acknowledged that the “superintendent represents the image of the district” and that “once we have what we want to do, I will go out again when I can engage (parents and teachers) face-to-face” to explain how they will accomplish their mission. “We want graduation, bar none, not just college eligible but also getting students to be productive citizens,” King said. “Getting them to get a diploma in hand and being eligible to get to college, if that’s their choice, and everything else that supports that happening” is now the district’s clear mission, she said. The room contained about a dozen onlookers, half staff members and half media. The school board members, King and Nelsen sat around a boardroom table with religious iconography hanging over them and bulletin boards listing characteristics of a successful superintendent and school board. Although the committee meeting wasn’t televised live as meetings at LA Unified headquarters usually are, an audio recording is expected to be available in the next few days, said Board Secretariat Jefferson Crain. The off-site meetings held outside the regular Beaudry headquarters of the school district are considered “field trips” for the board, and although they are still open to the public, the off-site locations usually discourage the public from making comments. Vladovic said Tuesday that public comments made before the monthly closed sessions end up extending the board meetings much longer than anticipated. King said she would revamp the strategic plan in two weeks and then discuss the changes at the Oct. 25 meeting of the Committee of the Whole set for 2 p.m., although it is not yet clear where it will be held.